Charles David Keeling (April 20, 1928 – June 20, 2005) was an American scientist whose recording of carbon dioxide at the Mauna Loa Observatory first alerted the world to the possibility of anthropogenic contribution to the "greenhouse effect" and global warming. 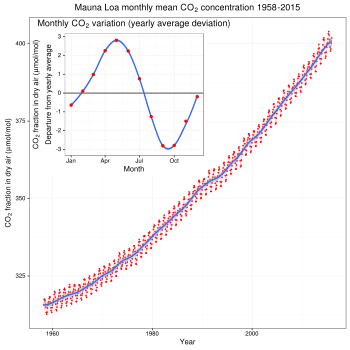 The Keeling Curve measures the progressive buildup of carbon dioxide, a greenhouse gas, in the atmosphere. Keeling was born in Scranton, Pennsylvania. He graduated with a degree in chemistry from the University of Illinois in 1948 and earned a PhD in chemistry from Northwestern University in 1954. He was a postdoctoral fellow in geochemistry at the California Institute of Technology until he joined Scripps Institution of Oceanography in 1956, and was appointed professor of oceanography there in 1968. Keeling worked at the Scripps Institution for 43 years during which time he published many influential papers. Roger Revelle, the Director of Scripps Institution of Oceanography, based at La Jolla, California, persuaded Dr. Keeling to continue his work there. Revelle was also one of the founders of the International Geophysical Year (IGY) in 1957–58 and Keeling received IGY funding to establish a base on Mauna Loa in Hawaii, two miles (3,000 m) above sea level. 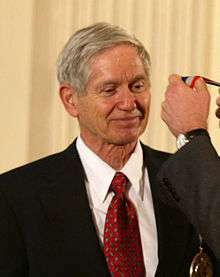 In 2002, President George W. Bush presented Dr. Keeling with the National Medal of Science, the highest US award for scientific research lifetime achievement. Dr. Keeling received the Tyler Prize for Environmental Achievement in 2005. The Keeling Curve is "engraved in bronze on a building at Mauna Loa and carved into a wall at the National Academy of Sciences in Washington." It was also a chart on the wall in a classroom at Harvard University where Dr. Revelle had moved to teach in the 1960s and where among others, student Al Gore would see and "marvel" at it. In 2006, Gore would feature the graph in the book and movie An Inconvenient Truth and for that work with climate change go on to win, with the United Nations' Intergovernmental Panel on Climate Change, the 2007 Nobel Peace Prize. The Revelle College apartments at the University of California, San Diego, which were designed to emphasize environmental awareness and minimize ecological impact, are named the Charles David Keeling Apartments in his honor. Keeling married Louise Barthold in 1955. They had five children, one of whom (Ralph Keeling) followed in his father's footsteps and is currently a climate scientist at Scripps Institution of Oceanography. Charles Keeling was also an accomplished classical pianist who almost chose a career in music. Keeling was a founding director of the University of California, San Diego Madrigal Singers. He was also general chairman of the citizens committee which drafted the Del Mar General Plan (or "Community Plan") in 1975. Keeling was a Guggenheim fellow at the Meteorological Institute, University of Stockholm (1961–62); a guest professor at the Second Physical Institute of the University of Heidelberg (1969–70) and the Physical Institute of the University of Bern (1979–80). He was a member of the commission on global pollution of the International Association of Meteorology, and scientific director of the Central CO2 Calibration Laboratory of the World Meteorological Organization. ↑ Harris, DC (2010). "Charles David Keeling and the story of atmospheric CO2 measurements". Analytical Chemistry. 82 (19): 7865–70. doi:10.1021/ac1001492. PMID 20536268. ↑ Heimann, M (2005). "Obituary: Charles David Keeling 1928–2005". Nature. 437 (7057): 331. doi:10.1038/437331a. PMID 16163339. 1 2 Rose Kahele. "Behind the Inconvenient Truth". Hana Hou! vol. 10, No. 5, October/November 2007. 1 2 Justin Gillis (December 21, 2010). "A Scientist, His Work and a Climate Reckoning". The New York Times. Retrieved December 22, 2010. ↑ Nemani, RR; Keeling, CD; Myneni (2003). "Climate-driven increases in global terrestrial net primary production from 1982 to 1999". Science. 300 (5625): 1560–3. doi:10.1126/science.1082750. PMID 12791990. ↑ Clark, DA; Piper, SC; Keeling, CD; Clark, DB (2003). "Tropical rain forest tree growth and atmospheric carbon dynamics linked to interannual temperature variation during 1984–2000". Proceedings of the National Academy of Sciences of the United States of America. 100 (10): 5852–7. doi:10.1073/pnas.0935903100. PMC 156290 . PMID 12719545. ↑ Gruber, N; Keeling, CD; Bates, NR (2002). "Interannual variability in the North Atlantic Ocean carbon sink". Science. 298 (5602): 2374–8. doi:10.1126/science.1077077. PMID 12493911. ↑ Keeling, CD; Whorf, TP (2000). "The 1,800-year oceanic tidal cycle: A possible cause of rapid climate change". Proceedings of the National Academy of Sciences of the United States of America. 97 (8): 3814–9. doi:10.1073/pnas.070047197. PMC 18099 . PMID 10725399. ↑ Keeling, CD; Whorf, TP (1997). "Possible forcing of global temperature by the oceanic tides". Proceedings of the National Academy of Sciences of the United States of America. 94 (16): 8321–8. doi:10.1073/pnas.94.16.8321. PMC 33744 . PMID 11607740. ↑ Keeling, CD (1997). "Climate change and carbon dioxide: An introduction". Proceedings of the National Academy of Sciences of the United States of America. 94 (16): 8273–4. doi:10.1073/pnas.94.16.8273. PMC 33714 . PMID 11607732. ↑ Bacastow, RB; Adams, JA; Keeling, CD; Moss, DJ; Whorf, TP; Wong, CS (1980). "Atmospheric carbon dioxide, the southern oscillation, and the weak 1975 el nino". Science. 210 (4465): 66–8. doi:10.1126/science.210.4465.66. PMID 17751153. ↑ Keeling, CD (1978). "Atmospheric carbon dioxide in the 19th century". Science. 202 (4372): 1109. doi:10.1126/science.202.4372.1109. PMID 17777967. Wikimedia Commons has media related to Charles David Keeling. "History of funding of Keeling's work". aip.org. American Institute of Physics. Archived from the original on May 24, 2013. Retrieved September 13, 2016.